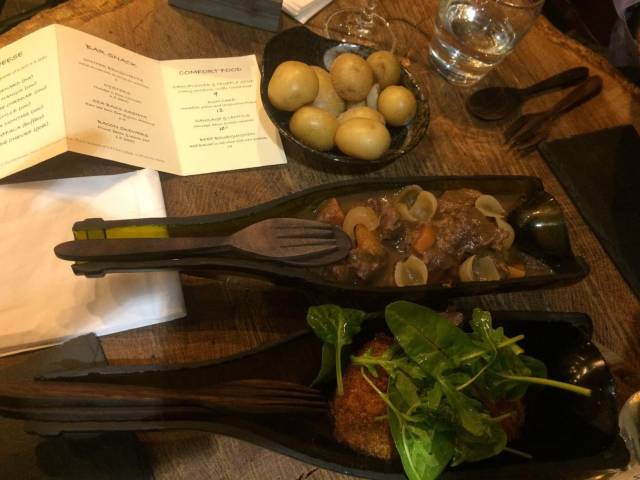 Le Cellar, St John Street’s newly opened wine bar is definitely worth frequenting. Antonin Charlier, co-owner/managing partner is a wine expert with impressive credentials, including former buyer and bar manager for Pascal Aussignac at the Michelin starred Club Gascon restaurant and sister bar in West Smithfield as well as Bulgari Hotel & Residences. Antonin and childhood friend and entrepreneur/TV producer/yoga teacher Simon Maniora have finally realised a long-held ambition to open their own wine bar/restaurant. 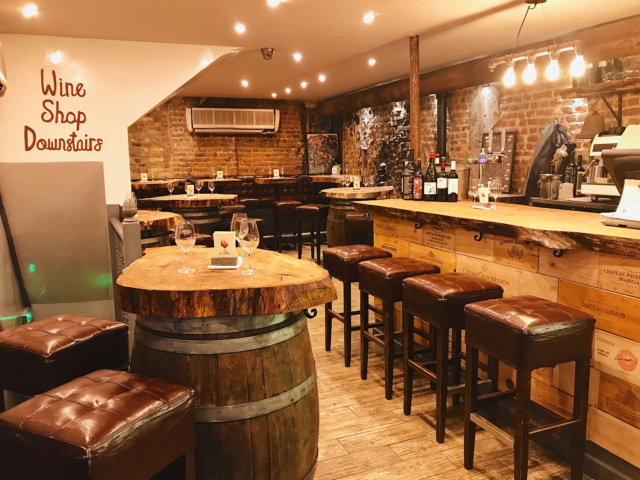 Le Cellar is a relatively short walk from the Barbican Estate, located in the first block of buildings north of the intersection of St. John Street with Clerkenwell Road and on the junction with Great Sutton Street. It occupies quite a small space which enhances the conviviality of the setting and yet the seating is still relatively well spaced. The warm friendly ambience is welcome on a wintry Thursday early evening as we join small groups of French and English diners. Oak bar counter and table tops (on large barrels) are hefty slices of a recently felled 270 year old Chingford oak, seating is comfy solid high bar chairs. It’s a corner spot so large windows look out to Clerkenwell’s rush hour. Tasty classic and contemporary dishes make up Chef Matt Smith’s menu. Antonin’s wine list is, he tells us, a living element of the restaurant and changes regularly. And don’t worry if you need wine-choosing advice, Antonin is charming and helpful. All wines are available to take away at 50% off drink-in prices. Food is delicious. Some of the smaller dishes are served on intricately decorated dark wood boards. Mains come in vertically cut half wine bottles. 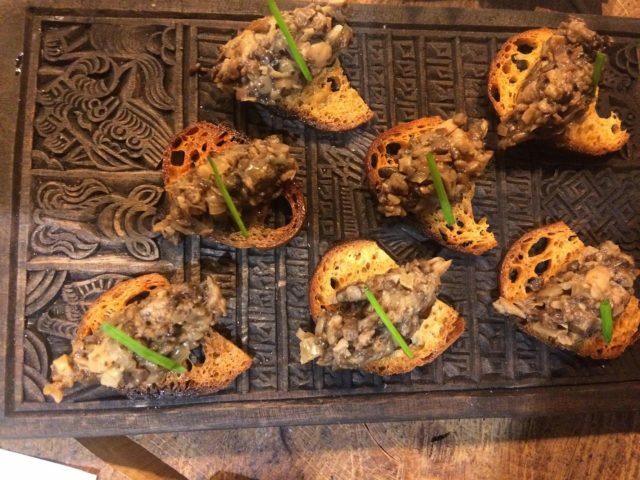 We try fresh sea bass sashimi with yuzu dressing (£6.50); skewers of soft bacon with prune and lemon zest (£1.50/skewer) – a very popular favourite; and winter bruschetta, which is wild mushroom duxelles on croutons (£6). For mains we try another favourite – tender boeuf Bourguignon in red wine with new potatoes (£14). This is classically hearty and flavourful. We also try the Monkfish and prawn fish cakes with langoustine bisque and green leaves which balance fish and crispy potato perfectly (£12). To follow we enjoy a mix of sheep, goat and cow milk cheeses (including favourites Caussenard & Deauville). 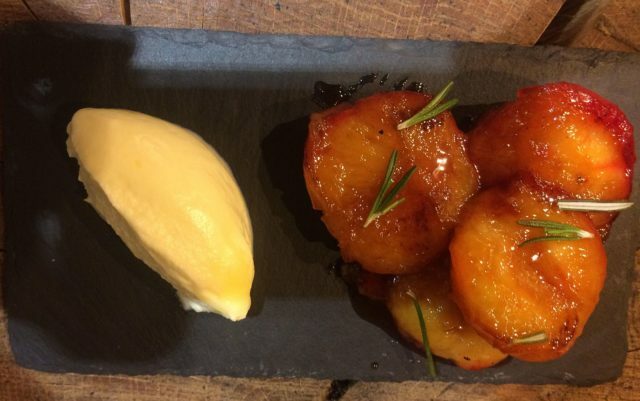 The evening gets even better with a dessert of rosemary poached plums and cream quenelle accompanied by a glass of Rivesaultes Ambre Chez Jau – glass £10. As a wine bar and restaurant within easy reach of the Barbican, it is highly recommended as a venue to spend time over a few glasses of wine with an extremely pleasant ambience. 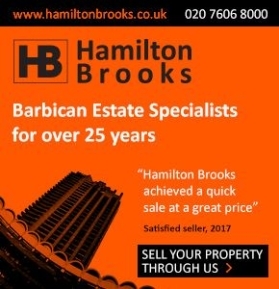 Well worth the short walk – or for those from further afield it is only a short distance too from Farringdon and Barbican tube stations.